Hopes of increased funding for new burdens have been raised by ministers. Local government minister Rishi Sunak has vowed that his department will ‘make a compelling case’ for more funding ahead of this year’s Spending Review. Funding for the Troubled Families programme could continue beyond 2020 after it was found three-quarters of councils are poised to make early intervention cuts. Funding for the Troubled Families programme would be better spent elsewhere, a former cabinet minister has suggested. A Staffordshire partnership has been making great strides in helping children and families in need in the county, with a big focus on early help. Mark Sutton explains. Stephen Curtis explains why information sharing is crucial to public service reform, while Stuart Bolton and Imogen Heywood take us through the key learning from new research in Staffordshire and Oldham. Five London boroughs have jointly commissioned a new programme to help vulnerable young people stay out of care. After an 18-year career in the Civil Service, running the social exclusion and troubled families unit, as well as leading high profile inquiries into Rotherham and integration, Dame Louise Casey talks to Heather Jameson. Local government is jaw dropping, can inspire citizens and, at its best, can outshine any part of Whitehall, former tsar Dame Louise Casey has claimed. The argument for early intervention sounds straightforward, writes Alison Michalska, but the difficulties lie in evidencing that it is working. Senior civil servant Dame Louise Casey has announced she will be leaving government in the summer after an 18-year Whitehall career. A respected transformation expert has praised the Government for emerging from a ‘stormy period of criticism’ and pressing ahead with its controversial Troubled Families programme. Local government’s largest trade union has called for improved pay and conditions for staff working on the Government’s £1.3bn Troubled Families programme. 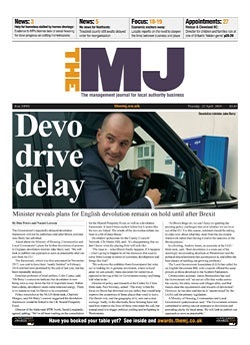 Public bodies must improve their data sharing regime to successfully tackle social challenges such as troubled families issues, the chair of the Communities and Local Government Committee has told The MJ. Extremism tsar Dame Louise Casey has admitted she is concerned about funding levels in key areas but believes the ‘money isn’t going to come back’.